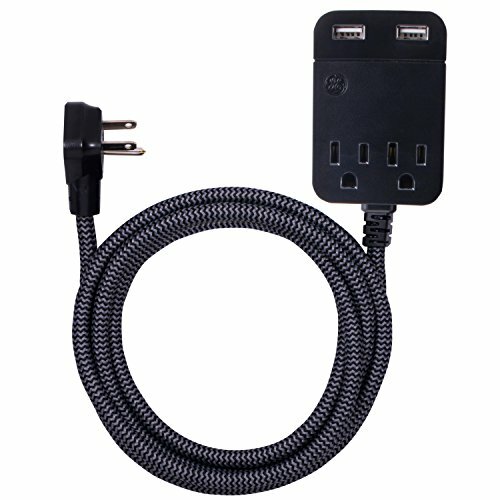 Get easy access to a USB charging port throughout your home with the GE Pro designer USB extension cord, 10 foot, 2 outlets + 2 USB. The extension cord, equipped with two USB ports and two AC outlets, is perfect for added convenience and flexibility while covering all of your charging needs. It Features 2.4a Ultra charge technology, optimized for up to 40% faster charging for your smartphone, tablet or other mobile devices, allowing you to spend less time tied to the charger! the GE USB extension cord with surge protection is also equipped with a flat plug so it stays close to the wall and out of the way, and is wall mountable for easier product use. This product is UL listed and intended for indoor use only. USB charging cable not included. SAVE SPACE: Keep other outlets accessible, reduce clutter, and save space with the angle flat plug. Leave furniture pushed against the wall with this slim design feature.